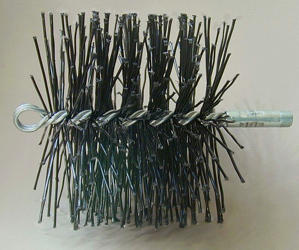 This 50 Round Poly Chimney Cleaning Brush is a must have for any chimney service professional. Its Prostran polypropylene bristles allow this chimney brush to maneuver easily in prefab chimneys and effectively clean zero clearance flues from the bottom up. The bristles are resistant to acid damage, and are designed for rough professional use. Its single-spiral spindle design and heavy-duty plated 3/8" thread double-swaged fitting provide the ultimate in durability for your chimney cleaning and maintenance needs. Can this clean from the bottom up? This particular poly brush can indeed be used to clean the chimney system from the bottom up utilizing rods with a 3/8" thread double swaged fitting. Is the choice 50 round poly brush really 6 inches or is it larger? Per the manufacturer, this brush is made to extremely close tolerances and should not be more than 1/32 of an inch off of the 6 inch measurement that is advertised. Previously ordered a supposed P50 brush from another unnamed co. starts with an A , received wrong product, sent back and reordered P50 got the wrong item again, looked on line found efireplacestore talked to a tech and was assured I would receive the correct item. This brush did a good job cleaning my chimney liner insert without any damage to the lining. Recommend this brush to anyone looking for a non-metal bristle brush. I cleaned my chimney after about 2 years of burning my wood stove about 20% of the time during the heating season. There was not much build-up in the flue, and the brush removed it without a problem and without damaging the SS liner. The threads on this brush were NPT threads. I used pipe connectors and pipe bushings to attach to my old fiberglass rods. There was no adaptor included, so we couldn?t get it to fit the standard-sized rods. You?ll have to get an adapter separately. But once you get it set up, the flexible brushes are a great, easy way to clean the chimney. We liked it so much we recommended it to friends. It worked very well for us. The whole thing is good construction. We had to pull pretty hard to get it through despite the curved flex part.